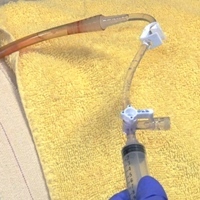 Megan Brashear, CVT, VTS (ECC), demonstrates how to manage a tracheostomy tube with a removable inner cannula. I could listen to Megan teach all day! Great video! One question: why not replace the inner canula with a new, sterile one and clean and sterilize the previously used one for re-use?